Spreading My Wings: The Asian Cup! 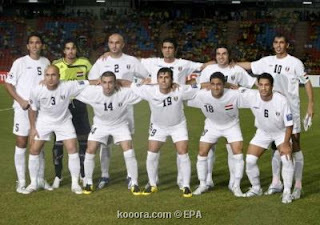 In tribute to the Iraqi football team, this post is written. I can only do as much for they made a whole nation happy. They helped giving us joy! yesterday they went to Iraq to celebrate the win there... The captin, Yunis, said he'd go running with the cup in Iraq and if he died, it didn't matter!!! no comment from my side on what he said! PS: I couldn't find a better picture so these aren't exactly the players that played at the final match but well, most of them did! I still remember (yeah, yeah - I'm quite the Olympics-obsessed person) the opening ceremony of Athens 2004. During the athletes' parade, Iraq was announced. It was a small group (football, actually), and they still got the biggest ovation in the stadium. Very moving.